At a certain point, a reality check was inevitable. This wasn't a new Warcraft real-time strategy game. It can be hard to remember sometimes given World of Warcraft's incredible popularity, but the franchise that's now synonymous with Massive Multiplayer Online Role-Playing Games (MMORPGs) for many gamers started out as something completely different. It was Warcraft: Orcs & Humans. First released in 1994 before Blizzard ever put out a Diablo or StarCraft game, this influential RTS was one of the first things that put the company on the map as a rockstar PC game developer. 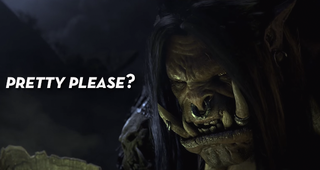 Blizzard kept making Warcraft RTS games for a while after Orcs & Humans. But by the time Warcraft III: Reign of Chaos came around, it was clear that Blizzard had something else in mind for the franchise. The game that ultimately came out in 2002 was still an RTS through and through, but it introduced strong role-playing elements with the hero characters that players controlled throughout the single-player campaign. Something about these heroes must've stuck, because by 2004—only a year after Blizzard released an expansion to Reign of Chaos—the company debuted World of Warcraft. And, well, the rest is history. Flash forward to 2014, and the Warlords of Draenor expansion for WoW is stepping back in series history to the time period in which the original Warcraft unfolded. This is fulfilling a dream for many. But it's not completely the dream we wanted. My nostalgia was so powerful that, shortly after building a new powerhouse gaming PC, I promptly installed Reign of Chaos anew and dove into its campaign. I was nervous to revisit a pivotal game from my childhood. But having replayed a good chunk of the single-player campaign, I'm happy to report that Warcraft III really holds up after more than a decade. The action felt as tense as ever when I built up my human bases and lead Prince Arthas to face the hordes of undead monsters that were invading. And just as importantly, the stakes of its epic high fantasy felt just as high when I watched in horror as Arthas journeyed through the snowy tundra to his tragic...fall from grace. I also noticed some things—particularly early in the campaign—that helped explain how isometric strategy games like this have changed over the past twelve years. One core problem that I willfully forgot was that, much like in the old Lemmings games, there can be a lot of downtime when you're just sitting there, watching as your troops hack and slash at their foes, waiting to see whose health goes down to zero first. This gets less dull as you advance in the campaign and unlock more units and building that add layers of nuance and complexity to the strategy in turn. But I kept running into the same problem of destroying an enemy base and then sitting there, waiting for my soldiers to topple every last one of the buildings. At one point, I felt an urge to turn the radio on. In between those fleeting moments of tedium, however, there's something incredible. I've played a lot of games over the past twelve years, so it's difficult to stir up the exact same thrill I had when I first booted up Warcraft III. But still: even by today's standards, this game feels epic in a way that StarCraft hasn't quite captured for me in the same way. Played at the right difficulty, certain levels in the single-player campaign turned into intense, pitched battles. One stage late in the night elf campaign lasted more than an hour. I barely noticed that much time had passed until I got up from my desk, since I was so lost in the violent ebb and flow of trying to keep my bases intact while simultaneously taking on my opponents. The hero units were a clever way to spruce up the RTS gameplay by giving you access to special defensive and healing abilities to help rally your troops, or offensive ones to rain down hellfire on the opposing forces. But then the awesomeness of hero units obviously lead to another question: why not make a game centered on those kinds of characters? Now we have a wide variety of games like League of Legends and Dota 2 that are often referred to as "action real-time strategy" because they did just that. Heck, Defense of the Ancients first started out as a mod for Warcraft III and its expansion pack. StarCraft, meanwhile, has stayed strong as Blizzard's core RTS game. And now instead of modding Warcraft III levels to make something like Defense of the Ancients, some gamers are modding StarCraft II to turn it into Warcraft as best they can. I can't read anything into the minds of these modders any more than I can speculate about Blizzard's intentions with Warcraft now or at any point in its storied history. But I also see a common longing here to revisit the glory days of Warcraft, before "World" was added to its name and changed the franchise forever.